“I would argue that essentially anyone who can spend a couple thousand dollars on a non-industry grade 3-D printer can literally make a plastic cloak overnight,” said Yaroslav Urzhumov, assistant research professor in electrical and computer engineering at Duke’s Pratt School of Engineering. Urzhumov said that producing a cloak in this fashion is inexpensive and easy. 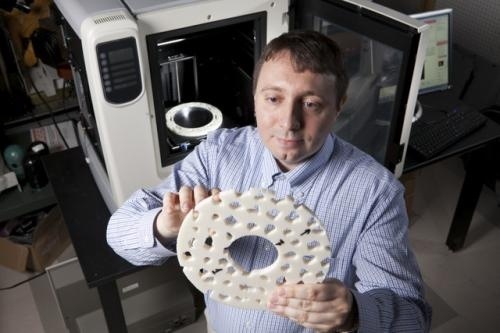 He and his team made a small one at Duke which looks like a Frisbee™ disc made out of Swiss cheese. Algorithms determined the location, size and shape of the holes to deflect microwave beams. The fabrication process takes from three to seven hours. Well ain’t that just Harry Potter cool? This entry was posted in 3D Printing, materials, Science, Tech and tagged 3D Printing, invisibility, metamaterials by Sci Fi Engineer. Bookmark the permalink.